If you have extra plumpness under your chin, Kybella® injectable fat reduction may be right for you. 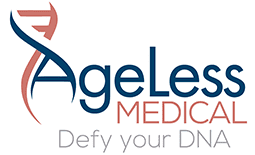 Advanced certified aesthetic injector Jill Girany, APRN, of AgeLess Medical in Cheyenne, Wyoming, offers this minimally invasive, FDA-approved medication to treat submental fullness, more commonly known as a double chin. Call her office or book an appointment online today to learn how Kybella can be an asset to your profile. Submental fullness is the clinical term for a double chin. You may have a double chin due to genetics or because of excess weight gain. As you age, a double chin can also develop due to skin laxity. Regardless of why you have a double chin, it affects your profile, appearance, and self-confidence. Kybella is the only FDA-approved injectable treatment for submental fullness. It contains the active ingredient synthetic deoxycholic acid. This molecule helps break down and absorb dietary fat. When injected under your chin, Kybella destroys fat cells that are then eliminated naturally by your body. The result is a reduction in your double chin that’s noticeable and that greatly improves your profile. Kybella is not intended for comprehensive fat or weight loss. If you’re bothered by the look of your double chin, Kybella may be the right treatment for you. In some cases, your double chin may make you look heavier or older than you actually are. You may find that diet and exercise helps you lose weight in other places, but your chin stays full. Kybella is an alternative to invasive surgical methods of reducing fullness under your chin. Liposuction may reduce chin fat, but it requires anesthesia and long recovery times. The best candidates for Kybella are at or near their healthy weight with skin that’s not too loose and saggy. Kybella can help patients of all ages. How many treatments will I need with Kybella? Jill Girany evaluates your aesthetic goals and develops a customized treatment plan for you. Most patients experience their desired results after two to four treatments, usually spaced about one month apart. Some people, however, do better with six treatment sessions. The destroyed fat cells can’t return or expand, so the results are permanent. However, if you do gain weight, new fat cells may form in the area, so complement your results by following a healthy diet and getting plenty of physical activity. To learn more about how your profile can benefit from Kybella injections, call AgeLess Medical or book an appointment online today.